Are you wondering how to start a WordPress blog? In this article, you’ll learn how to start a blog and how I’ve earned over $187,000 blogging since 2011. Oh, did I mention I’m a full time Physical Therapist? So if I can do it, you can too. Honestly, I think anyone can make money with a blog if they just follow through! I actually started my first blog in 2010 with zero website experience. I followed a simple blogging tutorial like this one and set up my first website. It was ugly, but within a couple of months I saw my first few dollars! Blogging allowed me to quit my job and go back to school to become a PT. Whatever your reason is for starting a blog, go for it! If you’re just not sure, or need a little more direction, sign up for my Free 5-day Blogging Course. I’ll lead you step by step through the process, sending you one easy to follow email each day for 5 days. This is a free course where you learn how to create a blog. 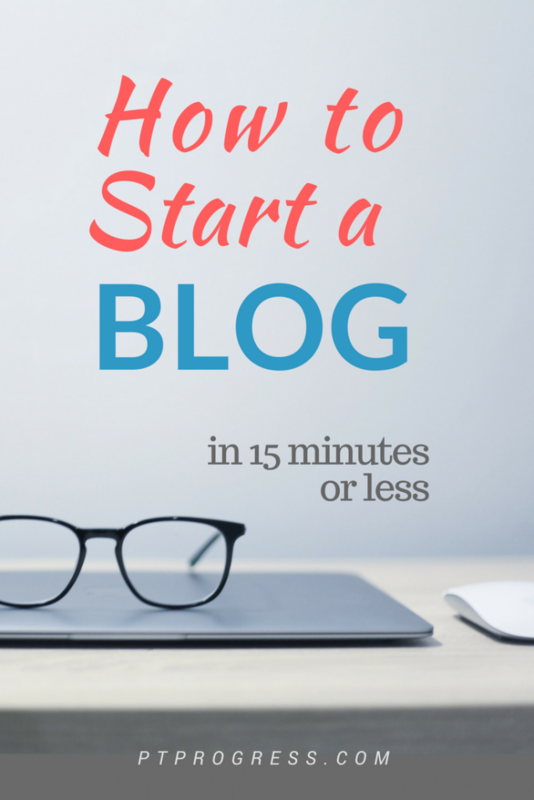 Over 5 days, I give you a step by step guide that simplifies the process of starting a blog and how to make money with it! Learn how I make a full time income blogging! Success! Now check your email to start the course! In this tutorial I show you how to start a WordPress blog on Bluehost. I’ve personally negotiated with Bluehost to provide you with hosting for $3.95 a month – an awesome deal considering I started at $10 a month back in the day! To get started, click here or the Bluehost image below and follow the steps to start a blog below. This is the time to set the vision for what you want to blog about. You can start a blog on nearly any subject, from health, fitness, career tips, mental wellness, personal finance, traveling, creating templates for almost anything, you name it! Most people usually get stuck on 2-3 ideas they’d be interested in writing about. The best advice I share with people who are interested in starting a blog is to choose a topic where you could easily come up with 50 article ideas or answers to common problems related to that topic. The next exercise in planning is to think about items that might be related to your topic. This can lead to potential income through affiliate (or partnership) platforms that pay a commission on the product. (This is one of the ways I make money online.) As you map out the ideas for articles, you might start to think of small guides or courses that could be valuable to the target market. Another successful strategy for selecting a blog topic is to start writing about a new subject that you’re interested in pursuing, like personal finance, paying off student loans, or traveling overseas. The beauty about blogging is this: you can become successful in almost any niche or subset of a topic if you put in the work. Once you have an idea of your topic, you can select your Domain name. If you already have a domain, so skip to section 3 to learn how to connect your domain with your hosting provider. Your domain name should be memorable, easy to say and read, and simple. Avoid using hyphens (-) and double or triple letters if possible. I prefer to purchase my domains through my hosting provider like Bluehost because it makes the initial setup very easy. A third-party domain provider like GoDaddy will work too. If you have a domain already, see the instructions below. You can actually get a free domain if you get you register through Bluehost when you sign up for a 12 month hosting plan. You need hosting anyways (see step 2), so you might as well get a free domain! To get started, use a domain name search tool like the one from Bluehost. I like this one because it provides 100+ alternative names that might work for you in case your first domain idea is taken. Sometimes a play on words is fun like the domain: ThePhotoGoat.com (G.O.A.T. – Greatest Of All Time), but it can also be confusing to some people. This might still work great if you decided to run with a graphic of a goat with a camera – again it’s all about creating something memorable but simple. The bottom line: Keep it simple and run with it! Most people will start finding your blog because of the content you create, but they’ll remember you easier if you have a simple and clever name. If you have a domain through GoDaddy or another domain name service, follow these steps. If you decide to get the free domain with Bluehost, you can skip this section! Change the nameservers to “NS1.Bluehost.com” and “NS2.Bluehost.com” then click save. You’re done! It may take up to 24 hours for the change to take place, but it’s really simple to do! There are a lot of good hosting companies to choose from, and I’ve used quite a few of them. 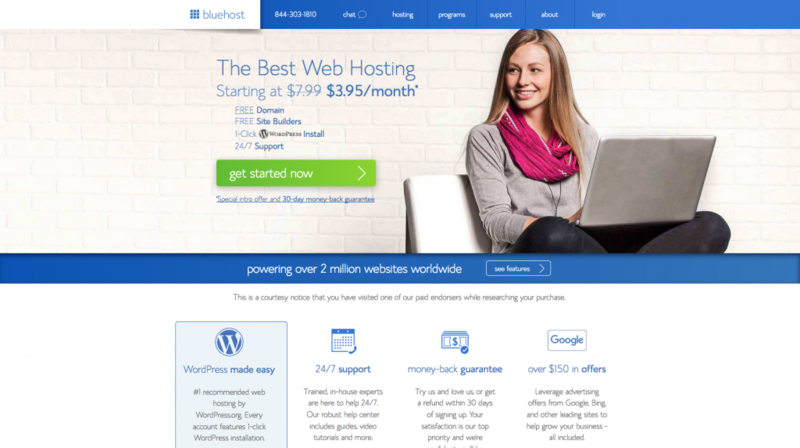 Bluehost continues to be one of the best hosting companies when it comes to support, ease of use, and price. I can’t emphasize the importance of reliability and customer service! This needs to be high on your priority list and it’s a key reason I use Bluehost. I’ll walk you through the process of setting up a hosting account, but let’s answer a few common questions about hosting. A host provides server space so you can store the files of your website and display it on the internet. You might have heard of a ‘self-hosted website’ which is what we’re talking about in this article. Self-hosted means that you have the ability to manage all aspects of your website and have greater flexibility in the long run. But what about free hosting? Why do I need to pay for hosting? You might have seen a free website on blogger (MySampleSite.Blogger.com) or even SampleWebsite.Wordpress.com. These blogs are not self hosted, which means you have less control, limited features, and limits in how you advertise (ouch!). Yes, they are free to set up, but being limited in your ability to generate revenue on your site isn’t my idea of a good time. Your best bet is to pay $3.95 a month for hosting. You’ll be happy you started out this way, trust me. 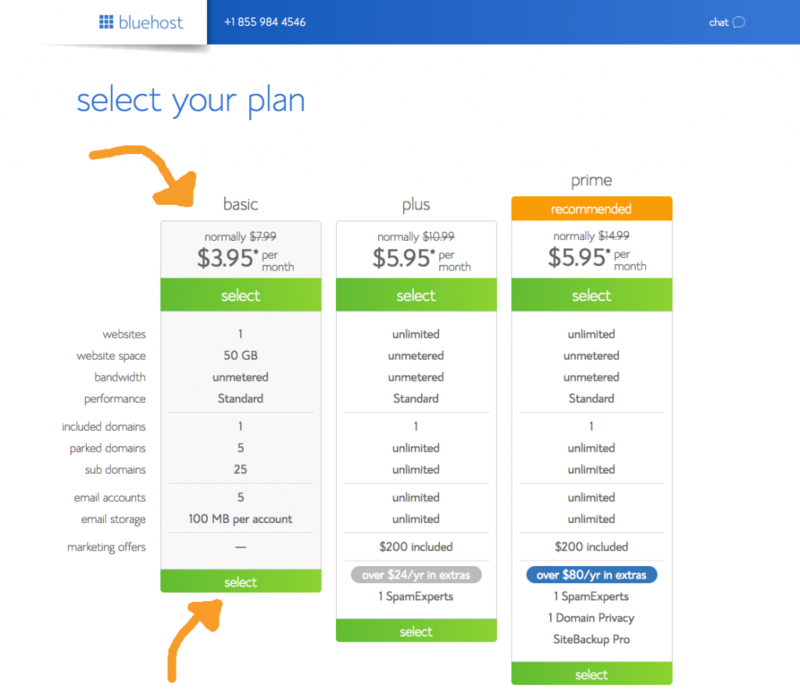 You’ll find 3 hosting plan options at Bluehost: Basic, Plus, and Prime. If you’re starting out, you really just need the Basic Plan. This includes your free domain and gives you everything you need to set up your website/blog. Hosting is only $3.95 a month with my link if you choose the 36 month plan. This requires you to pay in full to get the discount. (To put things into perspective, the cost of the 36 month plan is what I paid for 12 months of hosting just 5 years ago! It’s really a good deal). If you’re on the fence about paying for 36 months, you can select the 24 month plan at $4.95 a month, or the 12 month plan for 5.95 a month. You’re getting a good deal with any of these plans, but the best discount is with the 36 month plan. It’s an extra $36 for 2 years of hosting. That’s a steal considering I paid $10 a month for the longest time! For starting out, I recommend the $0.99 domain privacy protection option if you buy your domain through Bluehost. It just keeps your information private online. Personally, I uncheck the other options as you don’t need those to get started. Blog hosting will cost about $65 a year, or $140 for 3 years which is the best deal in my opinion. If you’re trying to keep your costs low, you can save a little money in the short run with the 12 month plan. The best value is the 36 month plan, which gives you a much lower average monthly rate. The basic info section needs to be completed along with the payment section. 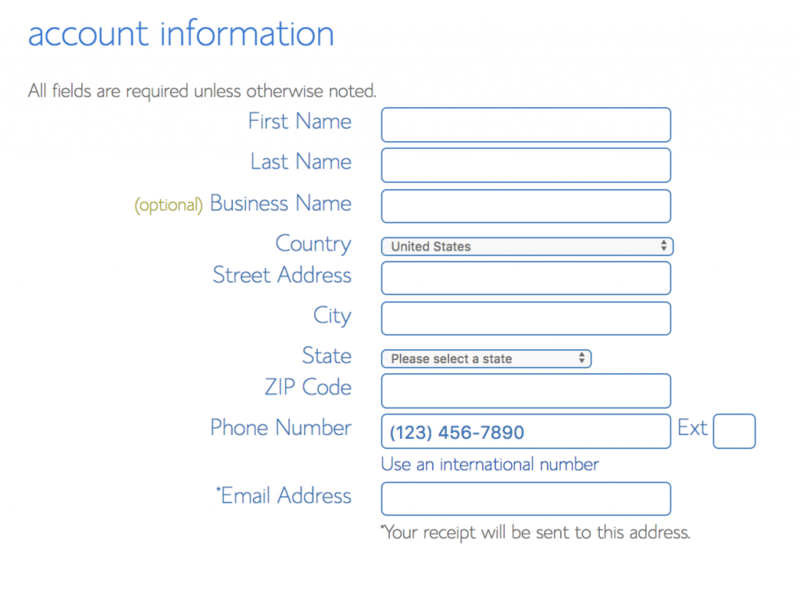 Here are some screenshots of the info you need to have when completing your account. Once you’ve selected the plan, added your info and payment info, you can hit submit and you’ve purchased hosting and your domain! Make sure you create a password once you’ve set up your account. Select your domain or enter your existing domain. Complete personal and payment info. Submit and Set up a secure password to login to your account. If you have any questions or problems, I am more than happy to help. Send a message to [email protected] I will personally work with you or connect you with my support team at Bluehost. Ok, you’ve set up your Hosting account (I hope you found it to be pretty easy with the step by step guide!). 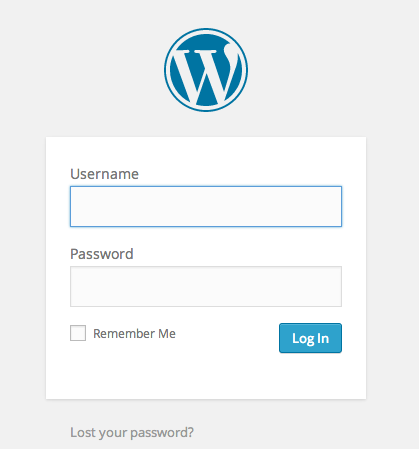 Now you can log in with the password you’ve selected and install WordPress. 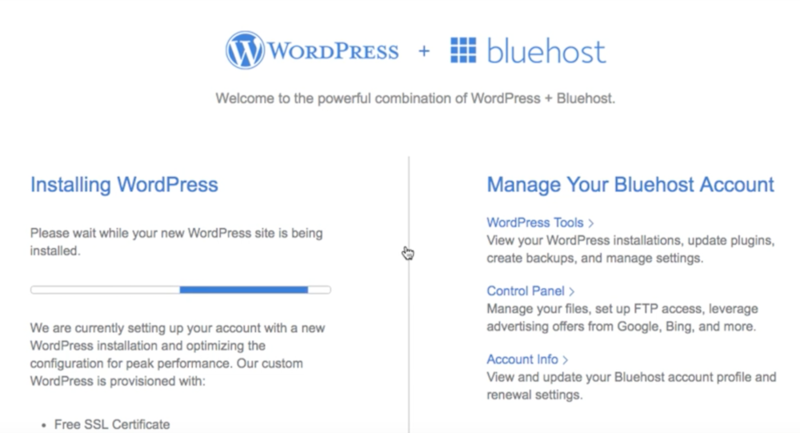 Bluehost makes it super easy to install WordPress. Follow a few simple prompts on Bluehost to complete the WordPress setup and you’re done! This is the WordPress backend of your website and is where you go to add pages, articles, and change up the design of your site. Speaking of design, let’s take a look at adding a theme to your website. Now that you have your website up and running, you’ll need to install a theme. There are a lot of free themes within WordPress, so you can start with one of these very easily. In the left hand column of your WordPress backend, select Appearance and browse the Themes listed. You have the ability to preview the themes and activate with one click. Personally, I use a premium theme called Genesis from Studiopress. It takes a little more work to set up, but I show you how to do this in the blogging course. There are a lot of awesome looking Genesis themes on Studiopress which is what I highly recommend for a professional looking website. The best strategy for growing your new blog is to be consistent with content and to connect with other bloggers. Aim to publish 10-15 articles on your blog and start reaching out to other bloggers to guest post high quality articles on their blogs. By giving away some of your best writing, you develop relationships with like minded bloggers and attract new visitors by adding links back to your blog. You absolutely need to start an email list. The #1 regret of most bloggers is that they didn’t start their email list sooner. Why is it so important? It’s the best way to reach your audience quickly and efficiently to share helpful information that only you can provide! As you build your community of readers, having an email list will give you the ability to communicate quickly. I use ConvertKit, which is a premium email list platform. I also use MailChimp – a free service that allows you to start capturing emails right away for $0. I try my best to create a custom image with each post. It helps each article stand out a little more and makes for a nice pin for Pinterest or a Facebook post. To simplify my life, I use Canva. I love Canva because it’s FREE, easy to use, and has a lot of awesome templates. You have the option to pay for pictures on Canva, but I use a lot of their free images a lot of the time! Your business should definitely have a Facebook Page but you might also consider adding a Facebook Group. Groups are more of a community area for people to discuss, post their own threads, and engage collectively. You can and should have both! By far, one of the most common questions I get is how do you make money with a blog? There are many ways to make money blogging, but the most common way people start to monetize their blog is through Google Adsense. Another way is through creating a digital product – we just created 2 and have started to see $500-600 a month in passive income from these! You can also make money with affiliate marketing, which is promoting a product or providing a review of a product or service and referring customers. One of the courses I took explains this process very well: Making Sense of Affiliate Marketing. I’ve earned over $120,000 just in affiliate marketing over the last 5 years and this course explains exactly how you can do the same. How Do I Log Into My New WordPress Blog? In order to log into your new WordPress website, you will need to use the username and password you established when you installed WordPress through Bluehost. Type in your domain followed by /wp-admin (www.yourdomain.com/wp-admin). This will take you to the login screen where you can enter your information (or even reset your info if you’ve lost your password or username). What if I need support on my new WordPress Site? One of the reasons I like Bluehost is because of their great support and customer service. If you are looking for a more specialized solution for a WordPress problem, you can contact the support team I use at iMark Interactive. They’re honest, fast, and very knowledgeable about all things WordPress. If you’re just getting started, all of this can seem intimidating. It’s a lot of information to digest at once, which is why I created a free course and video that guides you through each step of the process. If I can do it, you can do this too! It doesn’t matter if you’re a PT like me, a nurse, teacher, student, or a stay at home parent. You can learn how to start a blog and make money blogging in no time. Just a final reminder that you can get the special $3.95 rate through Bluehost with my link. If you have any problems with getting started, you can always contact me and I’ll be happy to personally guide you through the process. The whole process takes less than 15 minutes! Get started and have fun!